Joey was the most affectionate, loyal, loving, playful, nurturing and happy little dog I’ve ever known. 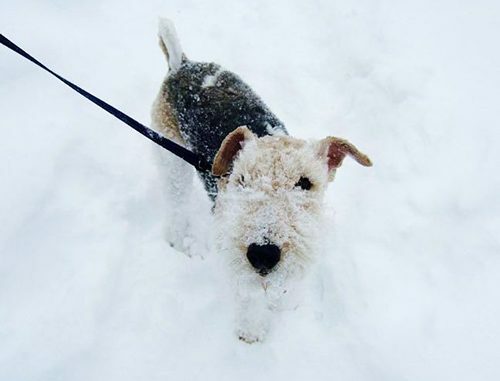 We discovered him through a Wire Fox Terrier rescue agency back in 2008 that specializes in finding forever homes for displaced/homeless dogs. I have no doubt that a Higher Power was responsible for joining Joey with our family, because we never even met him before deciding on adopting him. He was already 4 and a half years old when he joined our family, but from the moment we met him to bring him home, he was showering my father & I with kisses it was truly a match made in Heaven. My family and I know how blessed we were to have had nine amazing years with him, but as any pet owner knows, no matter how long you have with your beloved pet never seems long enough. Joey lived 13.5 years, incredibly, in near-perfect health. But in the early morning hours of May 17th, 2017, he had what we later learned was a stroke and my parents made the difficult, but selfless decision to put him to sleep that same afternoon. And, very sadly & regrettably, I wasn’t able to be there when he took his last breaths because I had undergone invasive brain surgery on the day prior, 5/16/17, and therefore I was hospitalized when he fell ill and when he gained his angel wings. It is that oddly coincidental irony that breaks my heart the most; I don’t feel any sense of closure since I wasn’t able to say “goodbye”. But, I’m very proud of this memorial/tribute video that I feel perfectly sums up the amazing companionship and love that we all had with little Joey. I’d be honored for anyone to watch it. Thank you very much in advance.